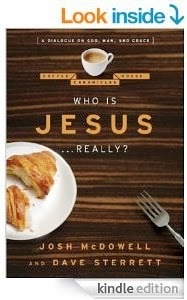 In Who is Jesus, Really? : A Dialogue on God, Man, and Grace, the group of students now meeting at the coffee house at a college town in Texas come face-to-face with the implications of the person and works of Jesus Christ. Their questions and conversations lead them to creatively respond to a well-known Atheist about Jesus' claims and actions. The other two books in the series: Is the Bible True, Really? and Did the Resurrection Happen, Really? continue the unfolding story at the college campus and the coffee house down the road.